Oklahomans should support State Question 774, a constitutional amendment on the November ballot that, if approved, would increase per-pupil funding to the regional average. The amendment is a long-sighted and game-changing approach to solve the systemic problem of inadequate education funding in Oklahoma, which ranks 49th in the nation and dead last in a seven-state region in per-pupil spending, according to studies. The historical and contemporary negative impact of this underfunding on student success, the high school dropout rate, the low college graduation rate and economic development here is incalculable. What is obvious is that a state that ranks so low in per-pupil spending tells its own citizenry and the nation that public education has never been nor will ever be a priority among its leadership. It tells the story that this state is anti-education and doesn’t care about children, its most vulnerable residents. This is simply a horrible message that depicts Oklahoma as a backwards place, not “a great place to raise a family,” whose leaders care more about punishing petty criminals-we rank first in the nation in female incarceration-than developing young minds. Let’s be clear: All SQ 744 would do is require the state to fund education at a regional average compared to Arkansas, Missouri, Kansas, Texas, New Mexico, and Colorado. Note the words “regional” and “average.” Note the words “New Mexico” and “Arkansas.” It does NOT mandate a tax increase, and the question provides for a gradual, three-year, phase-in of the initiative. The initiative would allow schools to hire and recruit more teachers and provide students with the latest technology equipment and software. It would help lower class size. More students could get individual attention. It would increase the state’s overall brainpower. If the initiative passed, public education would get a chance to finally flourish here. It’s not an all-encompassing panacea, for sure, but it would make a huge difference. The opposition to SQ 744 is fierce, well-funded and rooted primarily in those supporting corporate interests, including The Association of Oklahoma General Contractors, local and state chambers and The Oklahoman, perhaps the most anti-education media outlet in the nation. Two state think tanks, The Oklahoma Policy Institute (OPI) and the Oklahoma Council of Public Affairs (OCPA) oppose the measure. Politicians that I know and support or don’t know and don’t support are against the initiative. At least two political organizations oppose it, and there is overlap. For instance, Albert “Kell” Kelly, CEO of SpiritBank in Tulsa is co-chairman of the group Transportation Revenues Used Strictly for Transportation and calls the SQ 744 initiative a “stealth attack,” according to an article in the Tulsa World. Kelly is also a member of OPI’s Board of Directors. Here’s the anti-SQ 744 One Oklahoma Coalition’s Statement of Organization, according to the Oklahoma Ethics Commission. Note that the chair, Todd Hiett, who we can presume is the former Republican House Speaker in the Oklahoma Legislature, lists “Spirit Bank” as his principal place of business. By far, the most articulate voice for the opposition is David Blatt, OPI’s director. In a study brief issued last week, Blatt argued the three-year phase-in of the initiative would cost the state $1.7 billion. Blatt argued that much money would require the state raise taxes and cut funding to other areas of government. His published study received play in the state’s corporate media, and The Oklahoman editor Ed Kelley even appeared in a video editorial that cited Blatt’s work as proof voters shouldn’t vote for the initiative or the “raid on Oklahoma’s treasury” as he called it. But will the initiative require tax increases? That remains to be seen, but I think it’s possible, and yes, it might force a major re-thinking of how the state creates an annual budget. Recent tax cuts have mostly benefited the state’s wealthiest citizens, and State Question 640, passed in 1992, has made it virtually impossible to raise any type of taxes. The state also recently went through an extended period of declining revenues. But how about this: It’s also entirely possible the measure would force the Oklahoma Legislature and the then-Governor to reconsider the state’s overall tax structure and SQ 640 in particular. SQ 744 could be a positive catalyst for change in how government gets funded here, and it could benefit all agencies, not just education. (1) Oklahoma has historically underfunded education, other services and its infrastructure. How will the cycle of mediocre funding ever end without direct participation by voters? Does anyone think the state’s corporate power structure will support adequate funding for education or any other public service here? We have to start somewhere. The state ranks miserably low in medical outcomes, and this affects the state in a myriad of ways, including education, but how can we change that unless we have a more enlightened citizenry? How do we get a more enlightened citizenry without investing in education? (2) The state is currently playing out a conservative, political drama that goes like this: When revenues increase, the legislature gives out big tax breaks to wealthy citizens and corporations. Although it might slightly increase spending on education or, say, health services, it’s never significant enough to create real, systemic change. That’s intentional. I see no change in this pattern for years to come. In fact, I think it’s going to get worse over the next few years. The television advertisements of the Republicans running for major office this year in Oklahoma are virtually consistent in their anti-government, anti-spending rhetoric. Anyone in education here should be seriously worried. That’s not sloganeering or hyperbole. Imagine archconservative U.S. Rep. Mary Fallin as governor with GOP majorities in the House and Senate. That’s a probability according to the recent polling. This only makes it even more pertinent the state pass SQ 744. (3) Better education systems create a larger tax base and pay for investment in the long run. It’s just like businesses that invest for future financial gain. Whether you agree with that premise or not, nothing will ever be done about inadequate funding for education or anything else in state government-health programs, social services and infrastructure-unless there’s some type of financial risk. Those who oppose SQ 744 simply don’t want change, at least for now. Many of these people are willing to spend a lot of money to protect their own special tax breaks and income tax cuts. Does anyone really think it’s for altruistic reasons? Rich people get richer by manipulating the tax systems here in Oklahoma and elsewhere. Only an enlightened electorate that invests in education can stand up against them. We can only hope it happens here. 1. More than 14,700 students did not graduate from Oklahoma’s high schools in 2009; the lost lifetime earnings in Oklahoma for that class of dropouts alone total more than $3.8 billion. 2. Oklahoma would save more than $137.6 million in health care costs over the lifetimes of each class of dropouts had they earned their diplomas. 3. If Oklahoma’s high schools graduated all of their students ready for college, the state would save almost $39.5 million a year in community college remediation costs and lost earnings. I was in New York recently and visited St. Paul’s Chapel, which is directly across from Ground Zero. Many of the rescue workers after the September 11, 2001 attacks on the World Trade Center slept at the church on cots to catch some needed rest before going back to the disaster scene. 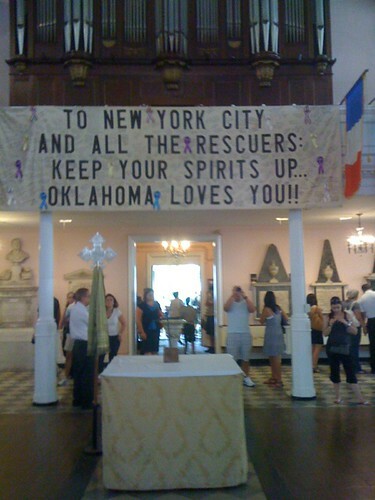 Hanging from one of the chapel’s rafters is a large, homemade banner from Oklahoma residents sending their support and love. To the left of the banner is a sign that reads HOPE. The corporate power structure here can and will demonize the initiative and its supporters, which includes the Oklahoma Education Association, but the prevailing spirit behind SQ 744 is embodied in that banner and in that sign. It’s about incredible acts of service and undying hope for our children’s educational future, not tax cuts for the ultra-rich.